Consumed over the ages for its useful properites, tea antioxidants hold many potential benefits. Black tea has been known to reduce the risk of heart disease and stroke, as well as increase the survival rate among patients who have already suffered a heart attack. It has also been known to decreas the likelihood of life-threatening blood clots. 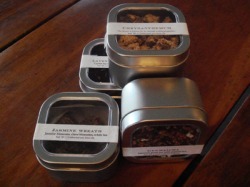 At Leaf Kitchen, we sell a variety of black teas in 2 ounce containers. The tea can be consumed here or on the go. As the name suggests, this is a good tea with which to start your day. A blend of three robust and flavorful black teas, this tea also stands up well to milk and sugar. A traditional Chinese tea, Lapsang Souchong leaves are smoked over a fire of pines, which gives the tea its most notable characteristic - a smoky flavor that is strong but also smooth. The flavor of traditional Earl Grey tea - a blend of bergamot oil and Ceylon - has added depth here, thanks to the addition of orange peel and corn flower petals. Ceylon is mixed here with just the right amount of rose petals to create a smooth, floral, highly aromatic tea. A traditional Indian tea, Chai is complex - sweet and peppery, with notes of cinnamon, cloves, and nutmeg. The components of the tea are finely ground to bring out each distinctive flavor. At Leaf Kitchen, we brew the tea in the traditional fashion, boiling and steeping it for hours, finally adding a bit of sugar to create an intense chai concentrate that can be enjoyed hot or cold with milk. Ceylon, the quintessential, simple black tea is dressed up here with lavendar petals. A cup of this tea is pure fruitiness; red fruits blended with smooth Ceylon make for a tea that is great any time of the day, but especially for an afternoon pick-me-up with a scone.